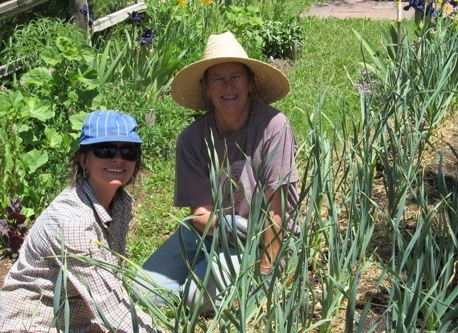 Earlier this week we featured CNG member Gael Minton of Squash Blossom Farm in New Mexico. Now we want to put the spotlight on the farmer network that she and few other women started in the region - Taos Women Farmers. A supportive network of fellow farmers, opportunities to learn and share, and only as much responsibility as I have time for? Yes, please! Read more after the jump. Back in 2006, six women farmers gathered around Gael Minton's dining room table to swap advice and tips, the names of their favorite seed suppliers, and the best performing varieties. Thus, the Toas Women Farmers was born! From those six women, the group has grown steadily. Now, in 2013, there are 54 women on the email list and 30 women attended their January meeting this year. None of the members have much extra time to attend a lot of meetings so TWF holds just handful of gatherings and farm tours each year, but they make those few meetings count. For their last winter meeting they invited 2 outside speakers, heard report backs from women who had attended the state’s organic conference, held a panel discussion “Why we farm”, and held a winter market of handmade value-added products. Neither do the members want the network to become too formal with membership dues or officer positions, so they keep it all volunteer. The group’s overhead is practically non-existent - doesn’t have a website, and they either meet at each other’s farms or rent out a space on a donation-basis. The main cost for organizing the network is time. Gael Minton is the main impetus behind the network - she keeps track of the email list, sends out reminders, and makes sure there’s space to hold the meetings. She has experience planning, organizing and managing, and enjoys the modest planning required to organize the group’s events. Other member volunteer their time to help as well, providing snacks for meetings, hosting farm tours, and moderating the meetings. The informal nature of the network means each person commits only to what they have time for. When asked why women are drawn to the network, Gael can name several reasons. First is the educational opportunities – both learning from others as well as sharing. Being part of the network also means there is group of people you can call for help if your bees swarm or you need extra transplants. Members like the unique sense of camaraderie in a group that is all women. In addition, being part of a network magnifies the work the each member does on her own. There is so much change that has to happen if we are going to be able to get more local agriculture. Even say 50% would require a massive effort and tremendous change…But the future is pretty bright really, as long as we can stay together as a loose network until there is a time when we really need to depend on each other.